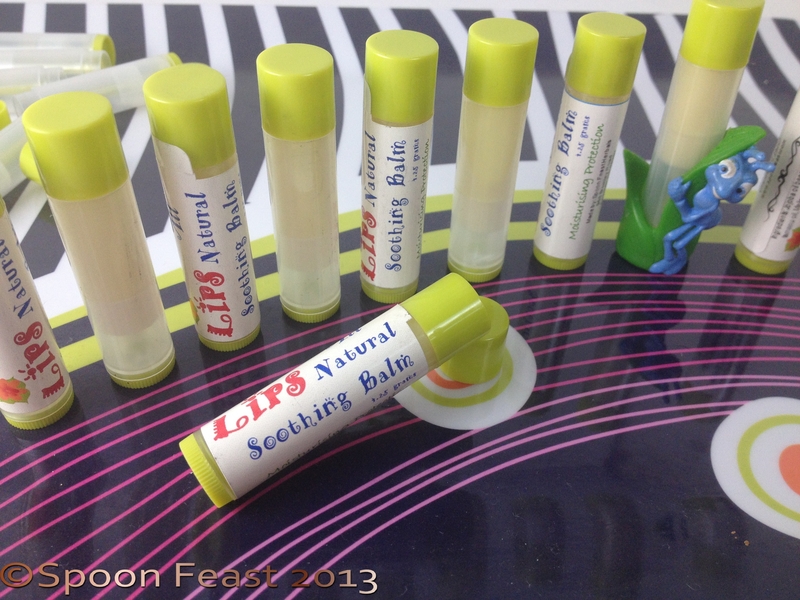 Lips All Natural Soothing Balm, my lip balm! Soothing lip balm is a must have, simply must have it available all the time. Addicted? To lip balm? Really? Personally, I don’t think that using lip balm can be addicting. The behavior can be compulsive, but lip balm is not a substance you get addicted to. I talking about the natural products, not the Carmex, Blistex and other chemical crap storms whipped up into a lip balm like substance. In my opinion, since the balm is going onto the lips, the ingredients shouldn’t be petroleum or chemical based. Since I use it all the time, I am very aware of what the ingredients of my lip balms are. Additionally I also realize the premium lip balms also cost a pretty penny. But now, I make them at home and have a huge supply of soothing lip balm for the cost of what one of the other tubes used to cost. Some balms have things that make your lips tingle. These can be more drying than they are hydrating. Lips have a thin skin, and they do not have sweat glands. This means lips need to be moisturized. Licking your lips, as everyone knows, is commonly reserved for drooling over food. It is one action that can chap your lips quicker than anything. Stop licking your lips! Supposedly, using peppermint and other mints in balm, attracts more blood to the area thus causing a “plumping” effect. Not quite as much as jabbing a needle full of plumping materials into your lips. But you certainly won’t end up looking like a platypus or have duck-bill lips. Just nice fresh, kissable lips that would taste good too. A note about tubes: buy the ones that have the “elevator screw” in them so the balm is easy to use. Buy the tubes with the elevator screw inside them. 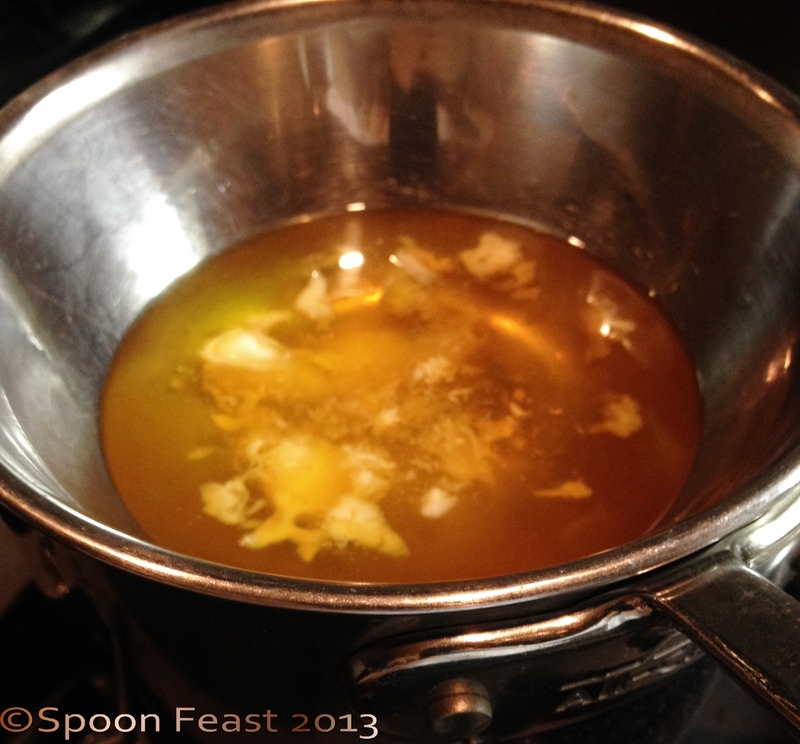 Over a double boiler, melt the beeswax. Once melted, add the remaining oils and butters, not the essential oils. Melt the beeswax. Add the remaining ingredients. The wax will firm up again. Just keep warming everything until it all melts together. Add essential oils after removing from heat. 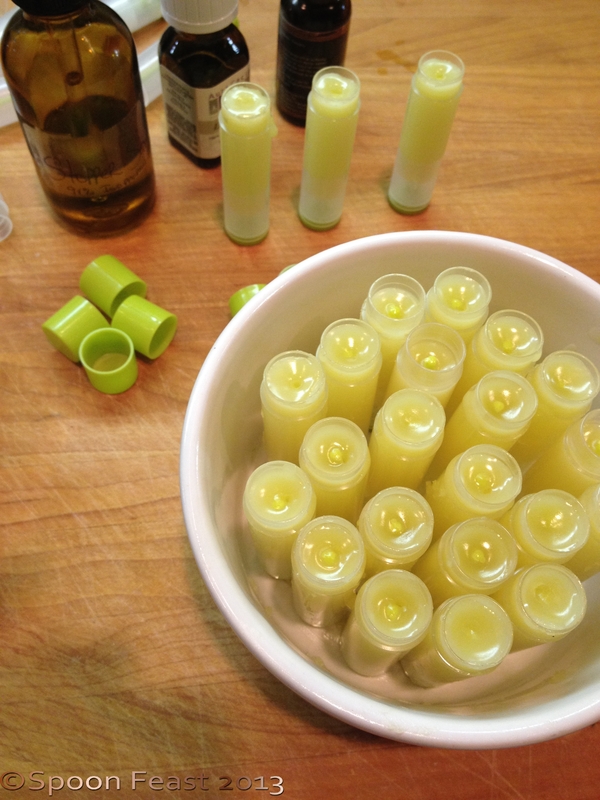 Fill lip balm tubes to the top. Allow the tubes to cool, then cap, label and enjoy! Stir until everything is melted. Remove from the heat, stir in the essential oils; mix well. Pour into tubes or tins, allow to cool before moving it around too much. 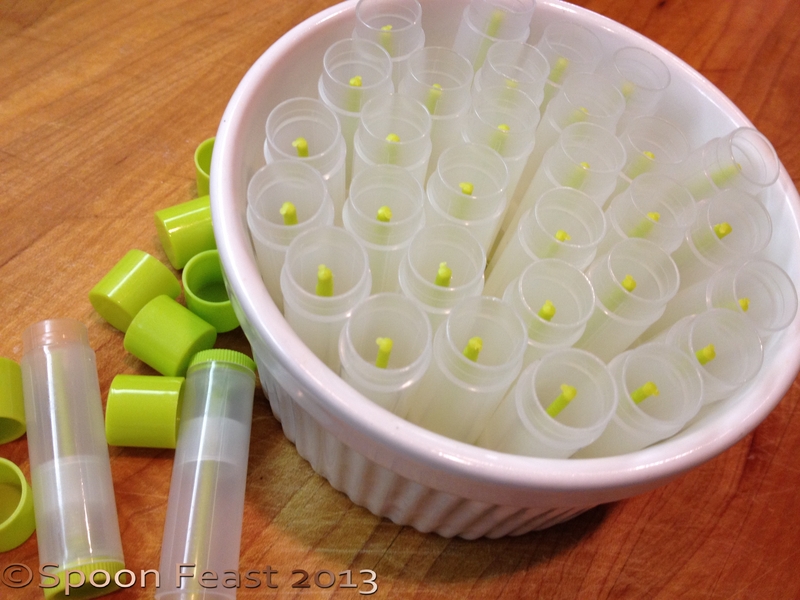 This will make about 10-16 tubes of balm that will keep for about a year in a cool dry place. 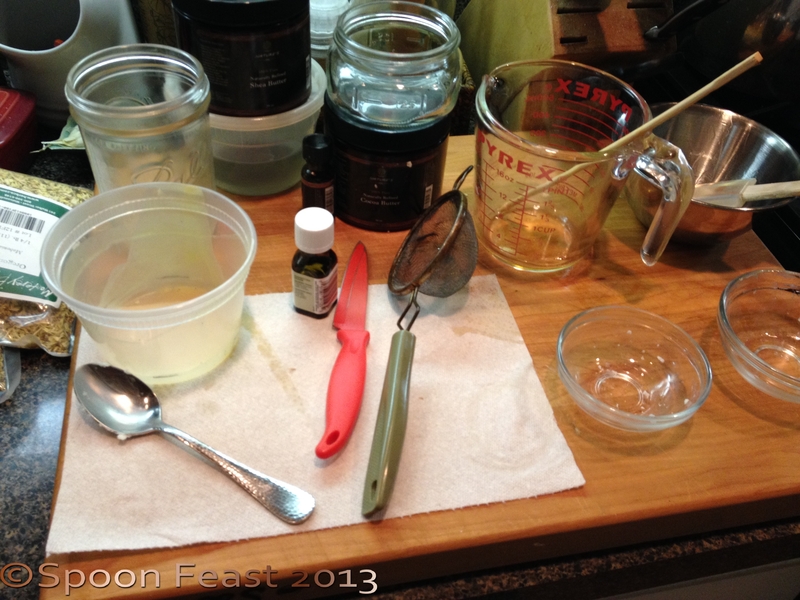 When you melt the beeswax, use a dedicated stainless or glass bowl or mason jar. The reason is, it is very difficult to remove all the beeswax from the melting vessel. If you dedicate tools and utensils for making balms and salves, you won’t have to worry so much about ruining things you use for food. I bought a small hand mixer to use for lotions and body butters so I don’t have to use my stand mixer. Line your filling area with parchment or a paper towel to catch any spills or drips. It makes clean up so easy! Add the essential oils after melting everything. This is so the oils aren’t released by the heat and are retained instead. 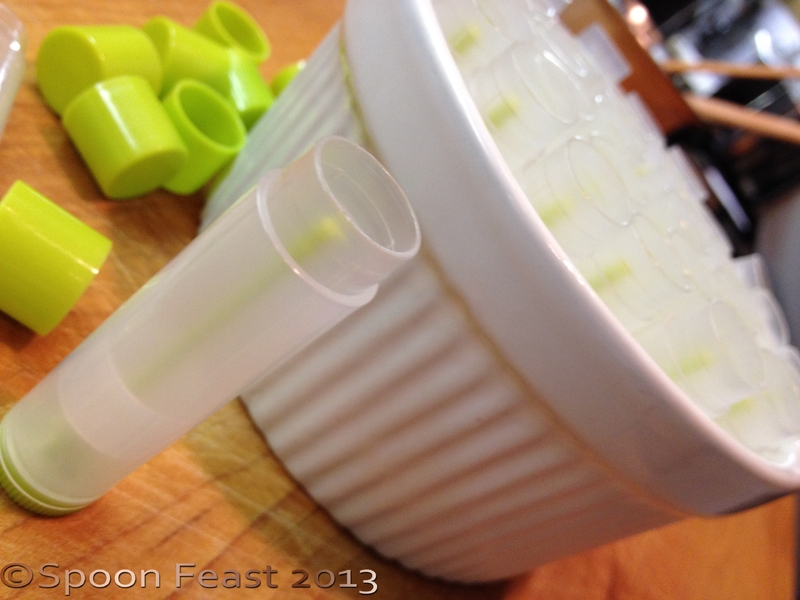 Use a glass measuring cup with a pour spout to fill tubes and tins easily. This balm with Eucalyptus and Lemon Balm is a soothing, healing formula. Perfect for those dry winter days ahead. If you want to change-up the properties a bit, use peppermint essential oil, vanilla extract or any other flavor or scent you would like. Keep in mind these go on your lips so you be tasting it too. I find adding honey makes the lip balm sticky and while I love honey, I’m not so fond of it, either flavor or feeling wise, on my lips. Where can you buy tubes or tins? Go here; Bulk Apothecary and search for your favorite tube or tin. They also sell supplies so stock up while you’re browsing! Please let me know how you like the balm. It is my new favorite! This entry was posted in Fun Crafty Things, Natural Body Care, Recipes and tagged Beeswax, Burt's Bees, Cocoa butter, Essential oil, Lemon Balm, Lip, Lip balm, Melissa officinalis, Shea butter. Bookmark the permalink. What a wonderful idea and great tips…thanks. Hi Pamela, It is amazing how easy it is to make stuff at home and it is usually a fraction of the cost and with better quality ingredients. Thank you, it has become my favorite lip balm! This recipe is my favorite. It’s smooth and soothing, i hope you try it and like it as much as I do!